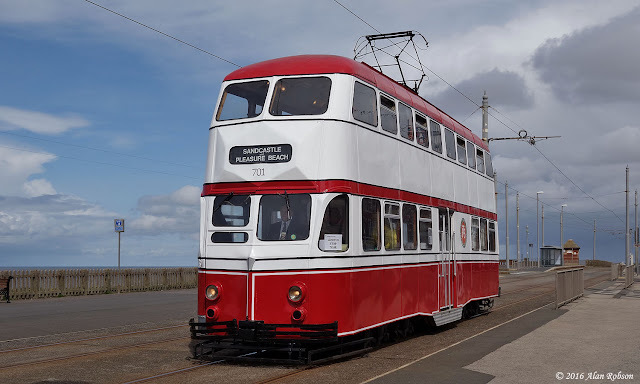 The Heritage Tour output for the enhanced timetable on Saturday 30th April was duty A: Marton Box 31, duty B: Balloon 701, duty C: Fleetwood Box 40, duty D: Railcoach 680, duty E: Bolton 66 and duty F: Twin Set 272/T2. The weather was a mixture of cloud and sunshine, with some hail and rain thrown in for extra measure in the morning! 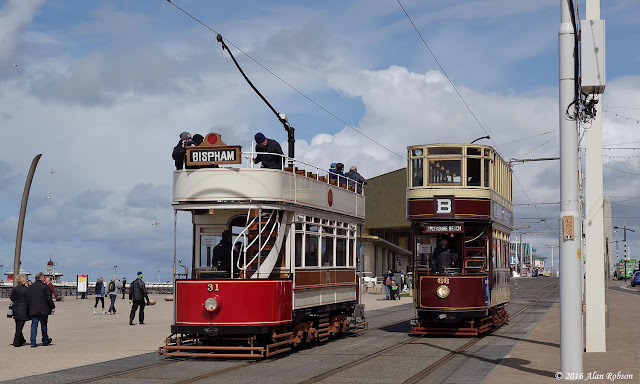 The weather gradually improved as the day went on, but unfortunately the decision to replace planned Boat 227 with Railcoach 680 had been made earlier on when the weather was rather more inclement. 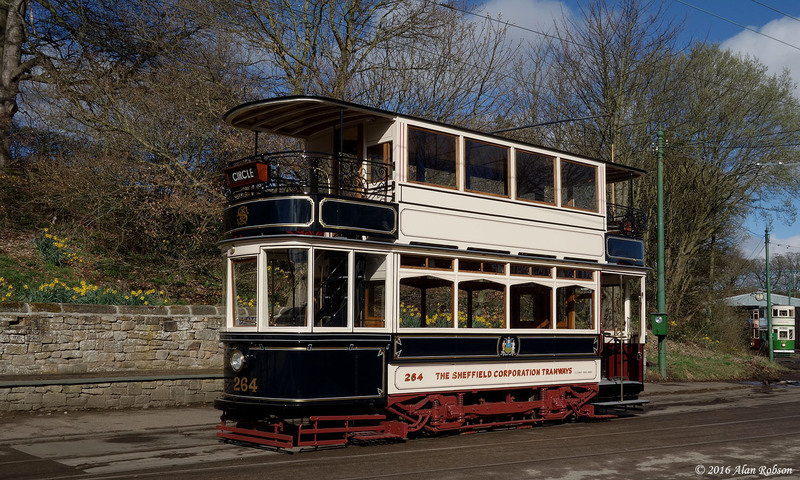 Balloon 723 was relaunched into Heritage Tour service today after being repainted in 1980s livery once again. 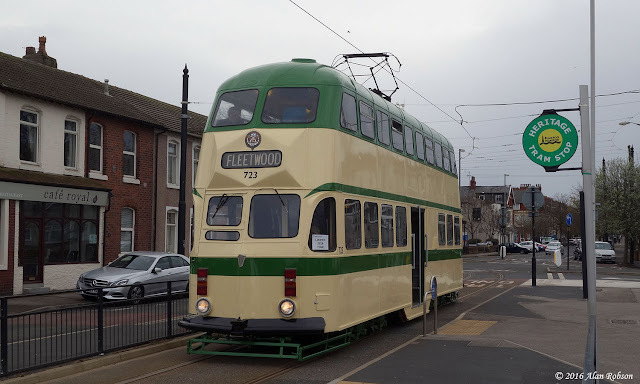 723 left Hopton Road at 1615, and then ran through to Fleetwood for its inaugural run in the new paint scheme. More trips were made up and down the tramway, before the tour was scheduled to conclude back at the depot at 2125. 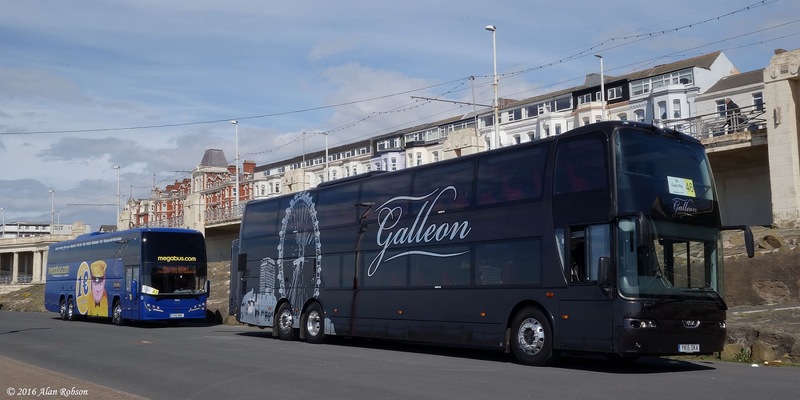 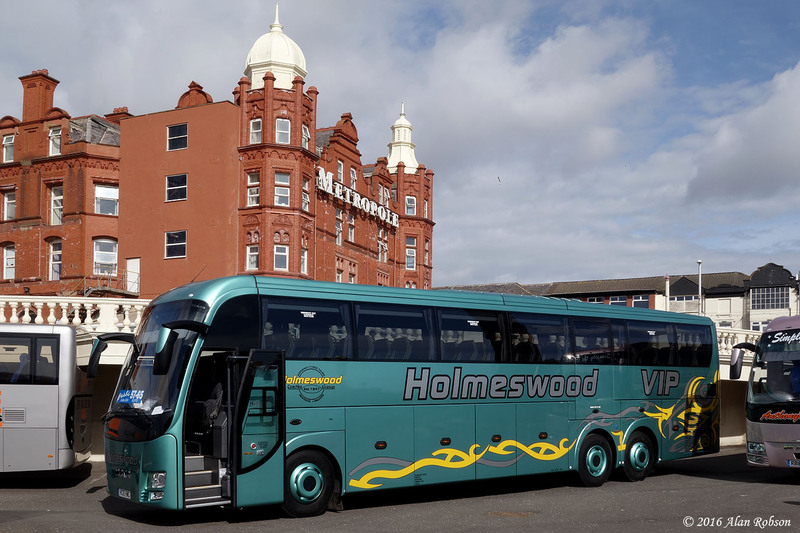 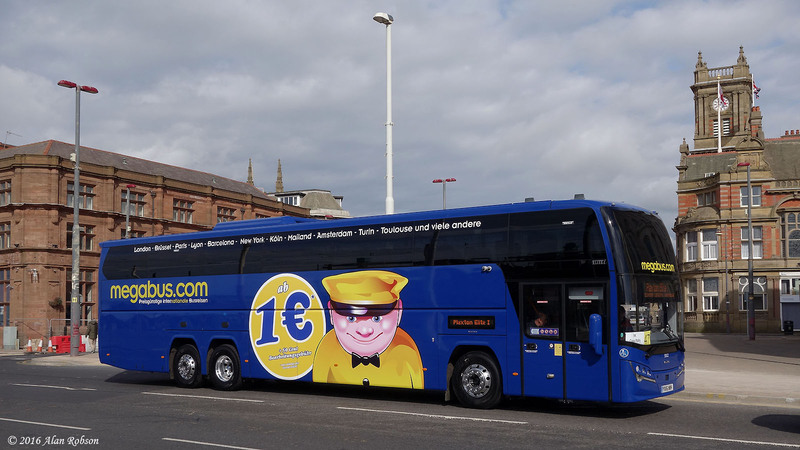 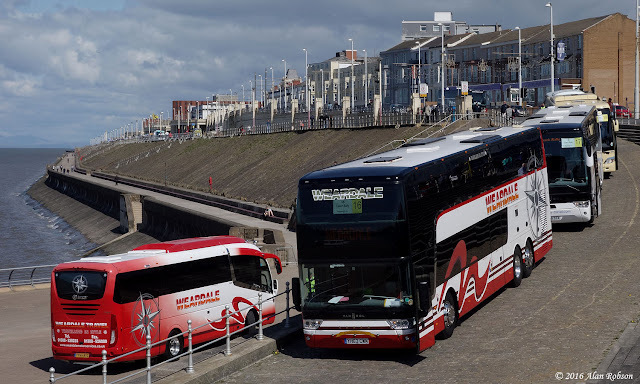 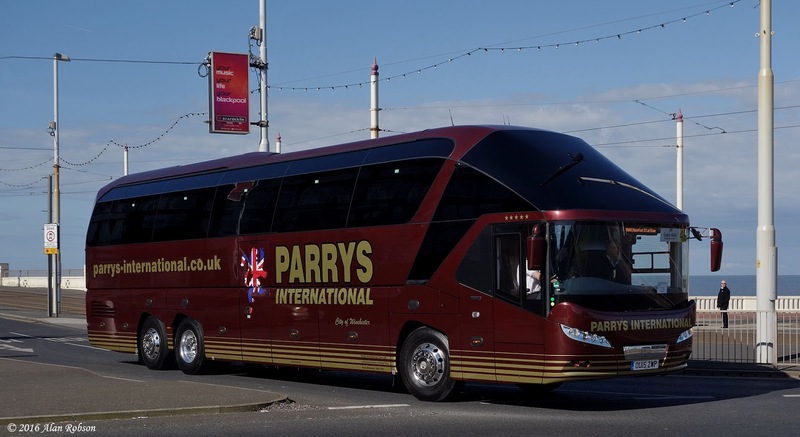 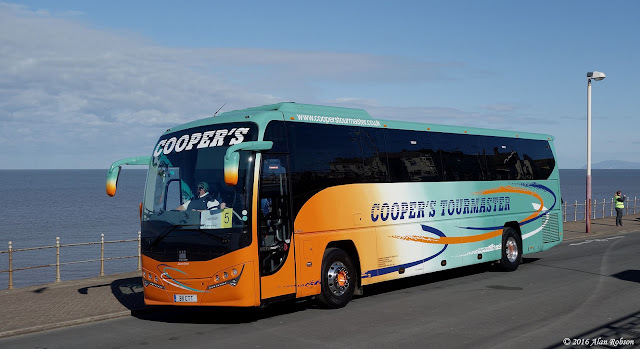 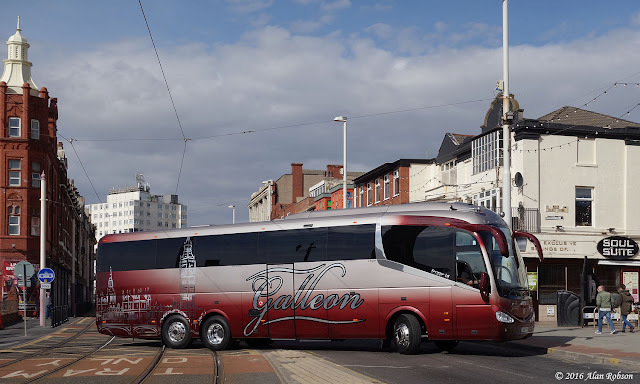 The 62nd annual UK Coach Rally was held in Blackpool over the weekend of the 23rd & 24th April, with the maximum number of fifty coaches being entered. 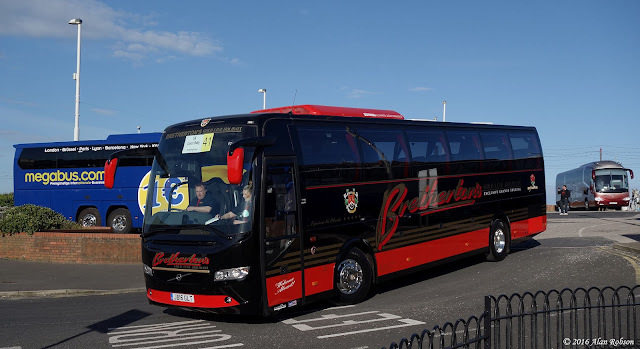 Since the first event took place at Clacton in 1955, the UK Coach Rally has acted as a showcase for coaching and coaching people. 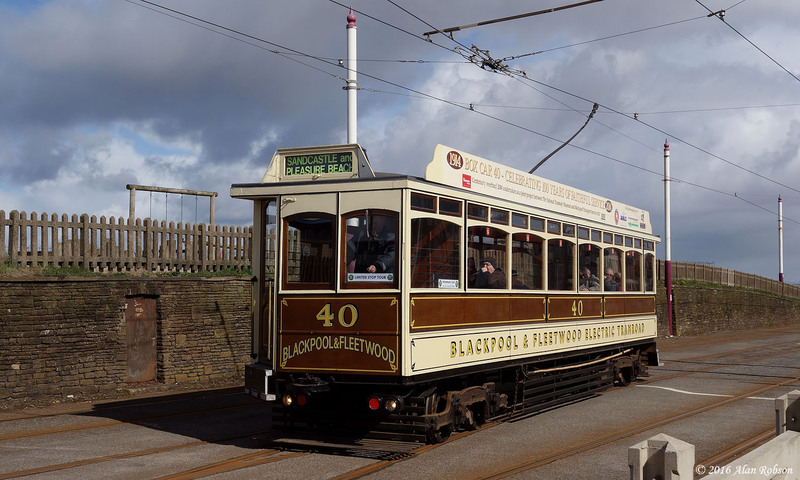 The 2016 rally began on the Saturday, with a road run commencing from Middle Walk in Blackpool at 0800 and returning there about two hours later. 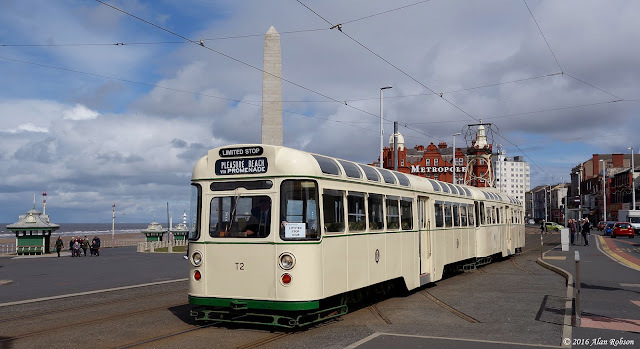 The next item on the agenda consisted of individual driving tests for each of the 50 entrants, this taking place on the lower promenade below the Metropole Hotel, close to the North Pier. 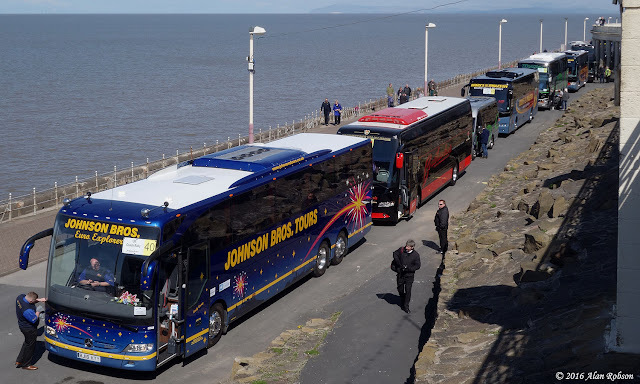 After the drivers had completed their driving tests each coach then made its way to the Tower Headland to be parked up for display with the rest of the entrants. 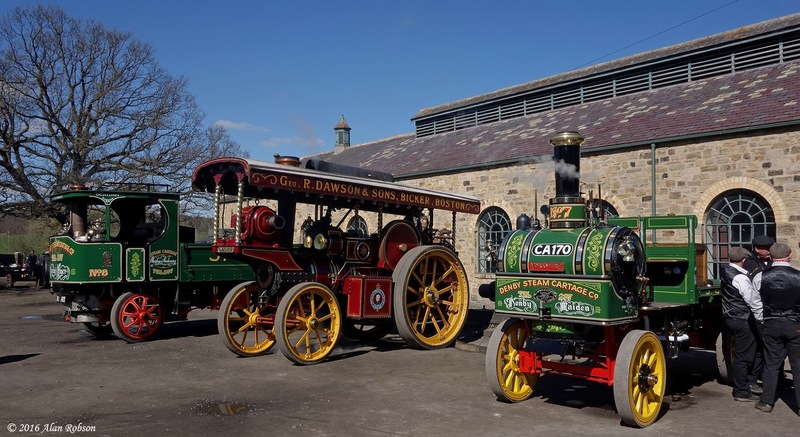 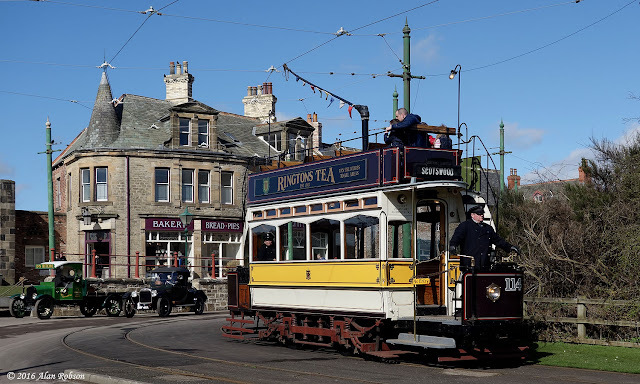 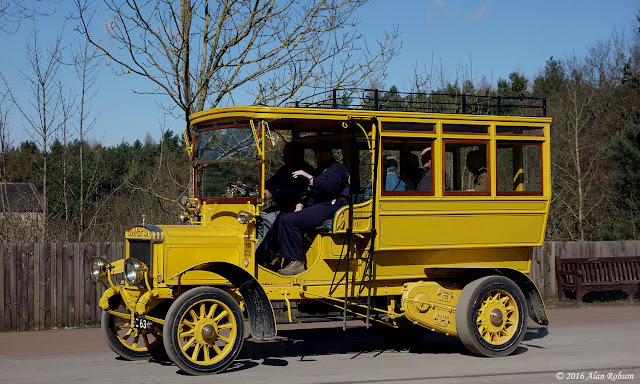 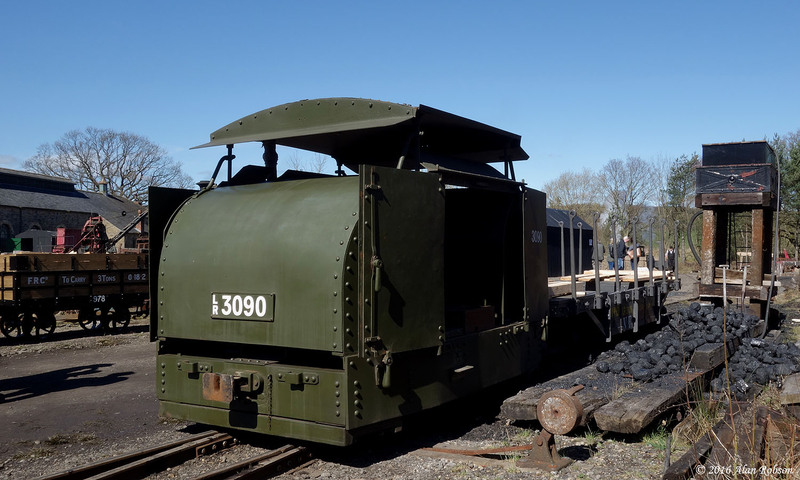 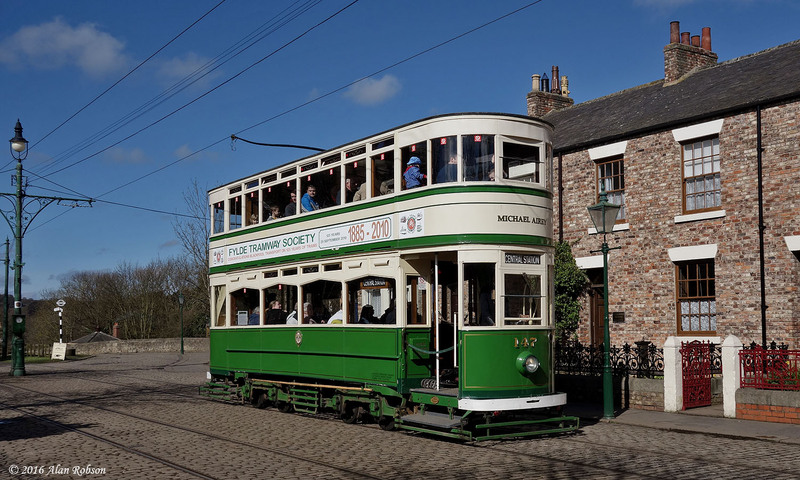 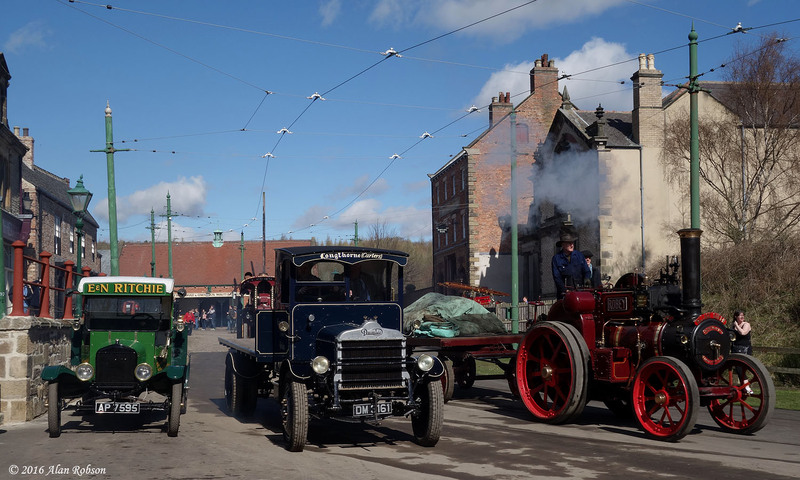 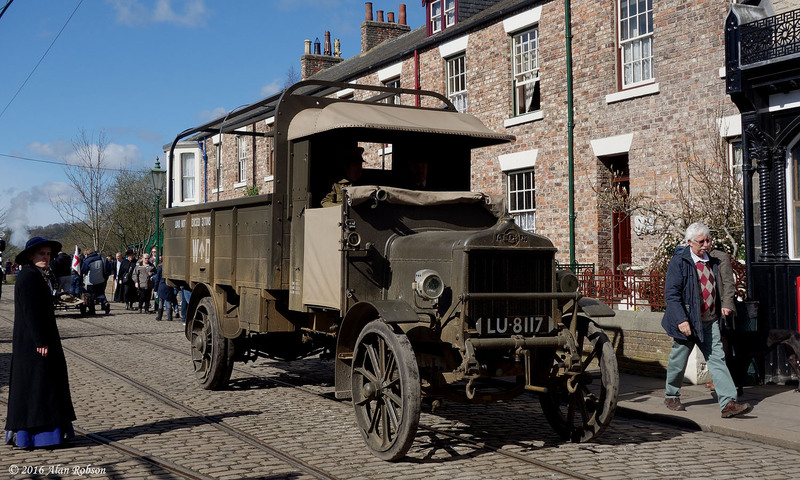 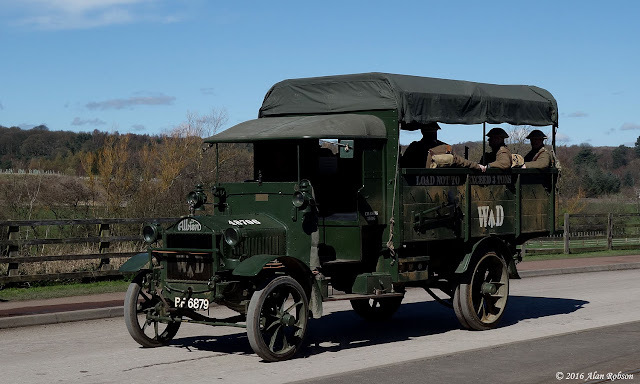 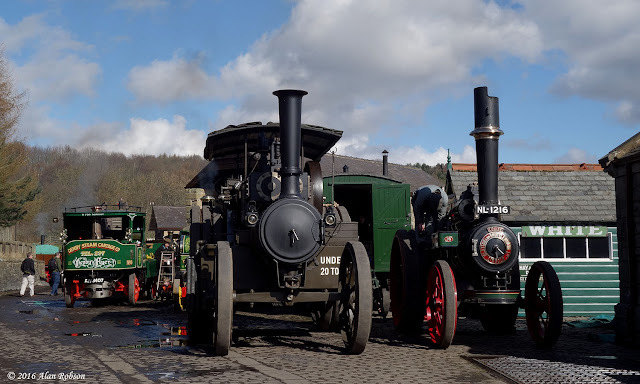 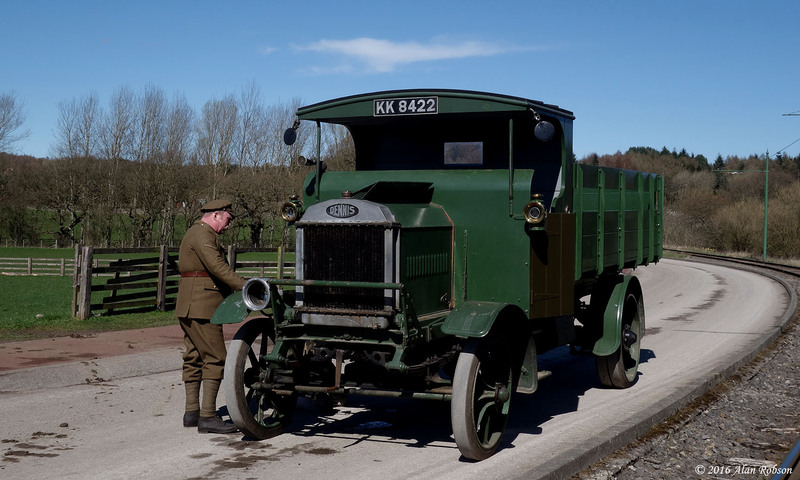 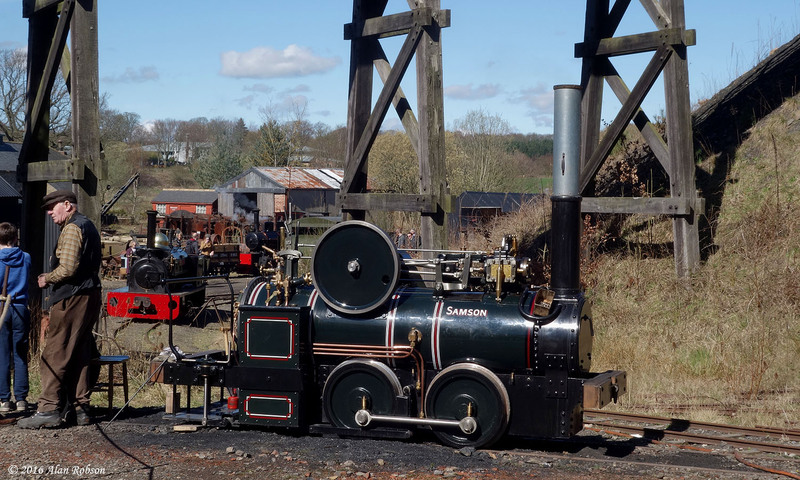 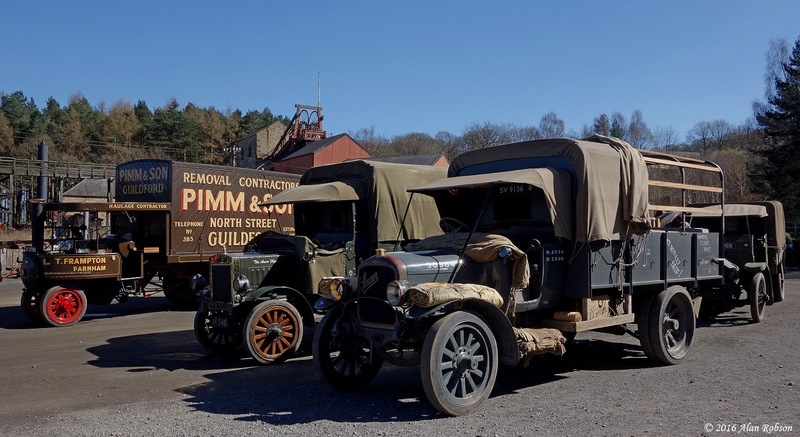 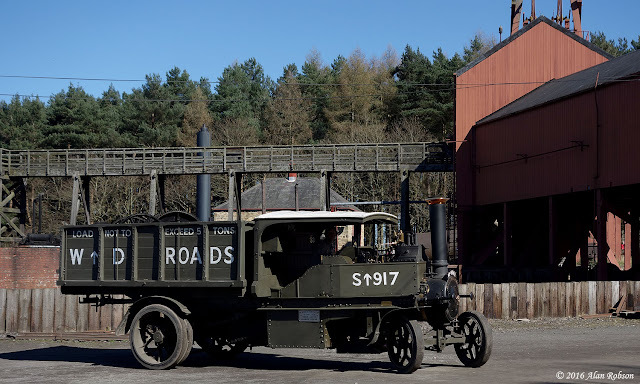 The annual Great North Steam Fair that takes place at Beamish museum each April was retitled the "Great War Steam Fair" this year, in order to commemorate 100 years since the First World War. 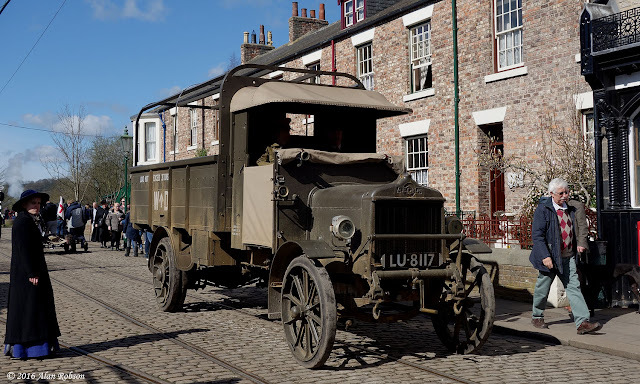 The theme was for WW1 era vehicles of all types to be invited to take part in the event, this gave a unique opportunity to observe a particularly elderly collection of vehicles in action around the site at Beamish during the four day event that ran from 7th to 10th April. 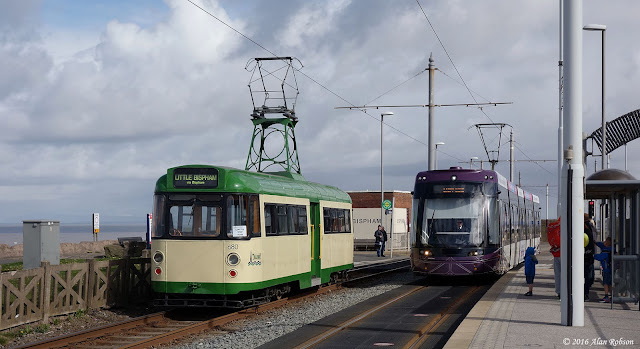 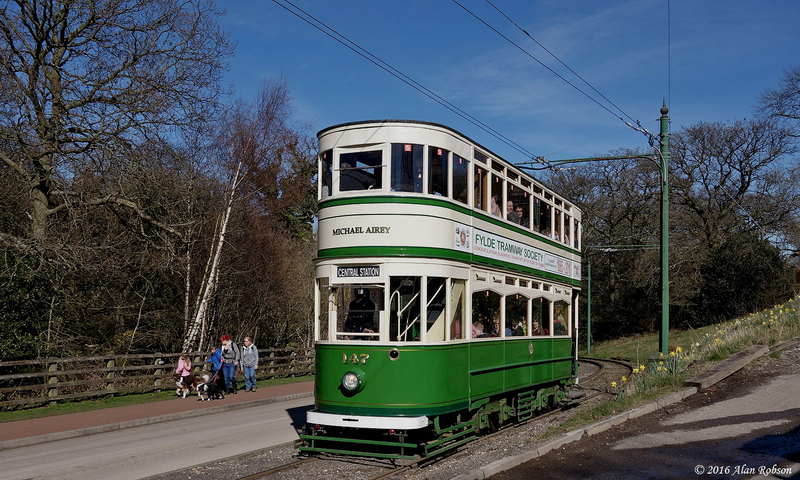 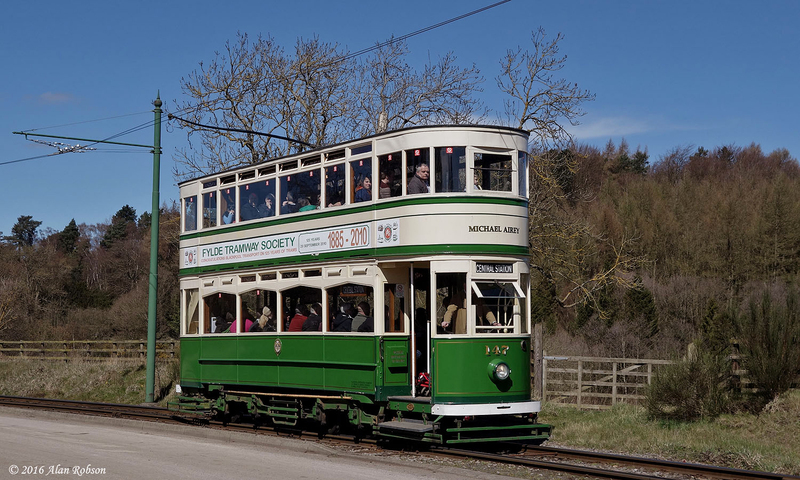 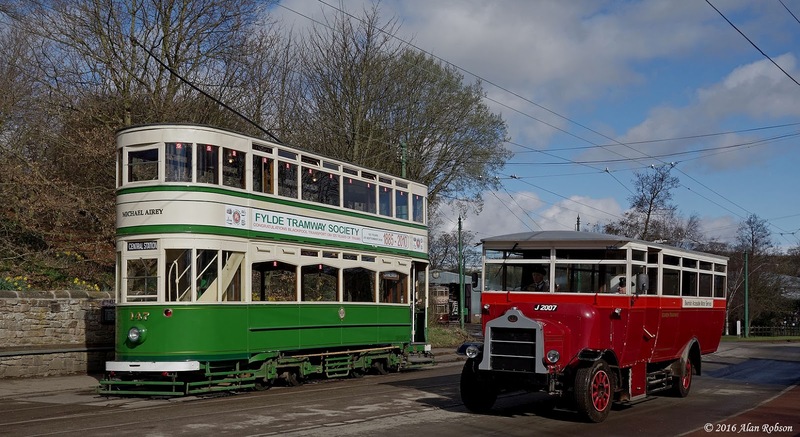 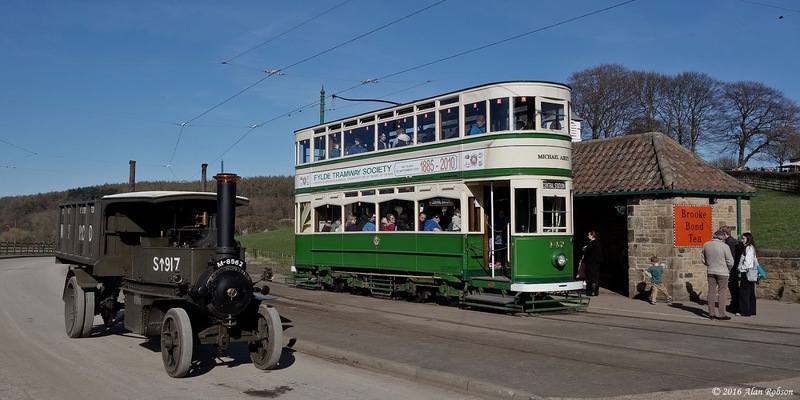 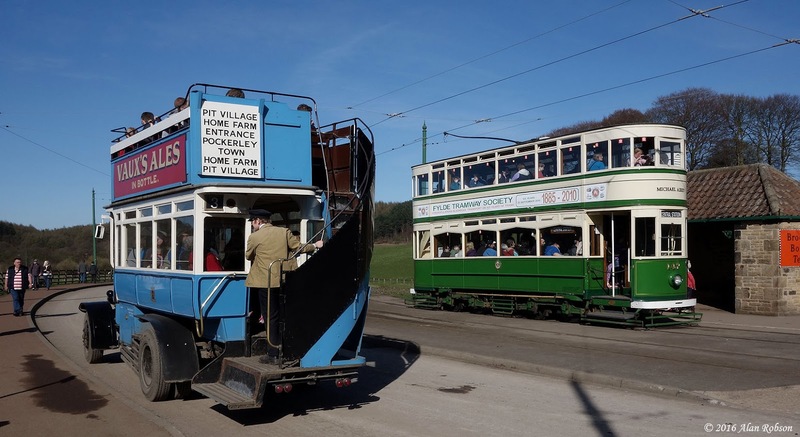 Saturday 9th April saw the return to passenger service of Sheffield 264 after an extensive overhaul and repaint, the tram having last seen use at Beamish over a decade ago. 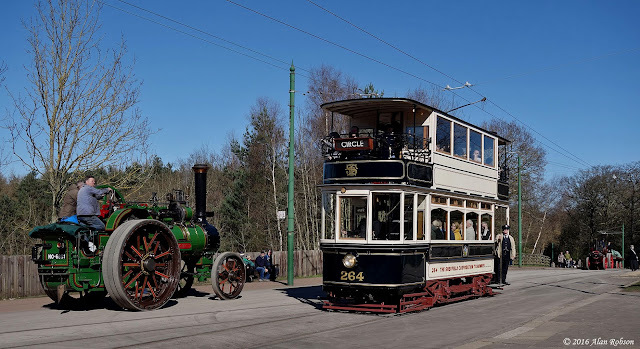 Sheffield balcony car 264 was delivered new in 1907 by the United Electric Car Company at Preston. 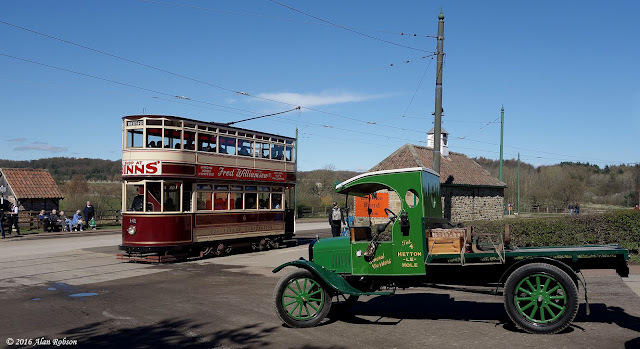 The weather was extremely variable over the four days of the fair, ranging from torrential rain and flooding through to glorious sunshine on the last day. 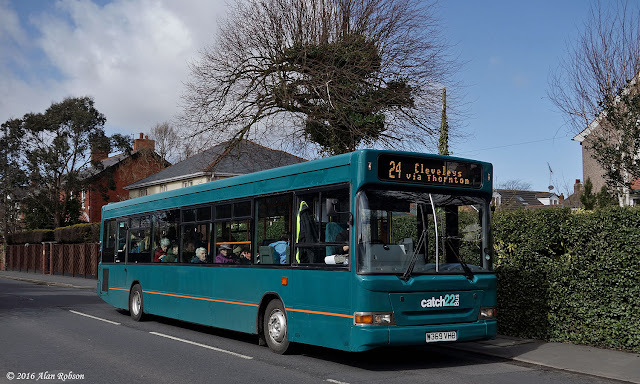 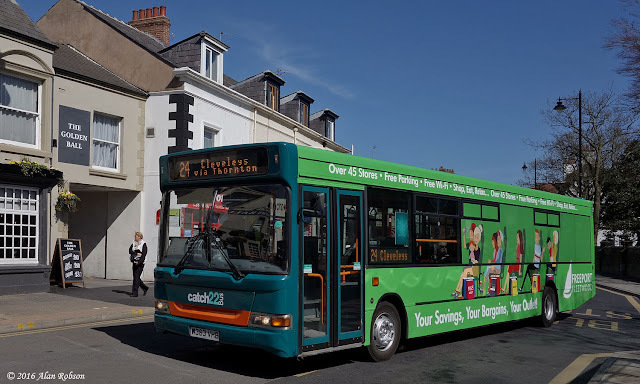 Former Cardiff Bus Dennis Dart W363 VHB entered service today with Catch22Bus Ltd in a pale green overall advert livery for Freeport Fleetwood. 363 has joined sister vehicles W366 & W369 VHB on the new service 24 bus route that operates between Cleveleys and Poulton. On 29th February Standard 147 departed Blackpool for the long journey north to the Living Museum of the North at Beamish in County Durham. 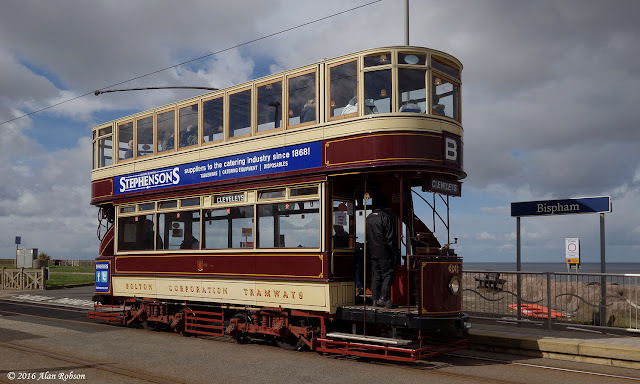 Blackpool 147 was being exchanged for long term Beamish resident Marton Box Car 31, which arrived in Blackpool two days later in order to take its place in the Heritage Tram Tour line-up for the 2016 season. Standard 147 was one of the four trams in daily use during the Great War Steam Fair event at Beamish, that ran from 7th to 10th April. 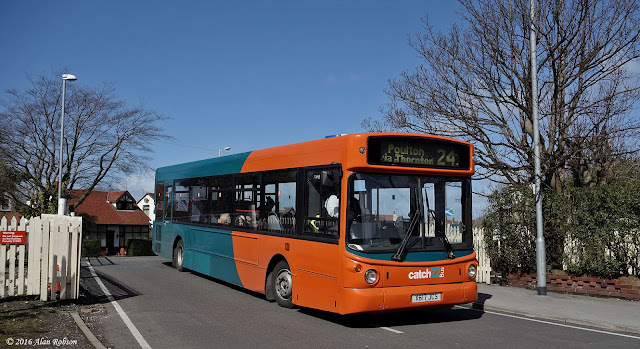 Catch22Bus Ltd began operating their new service 24 bus route on Monday 4th April. 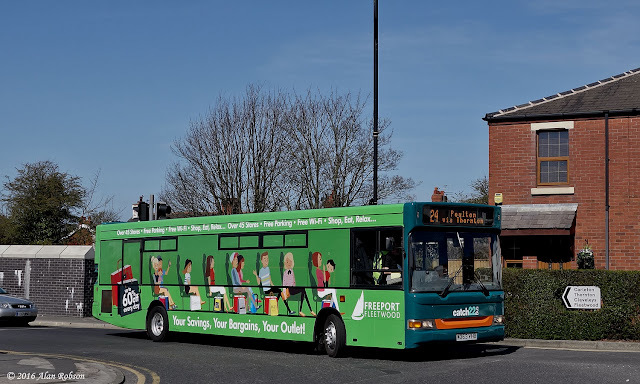 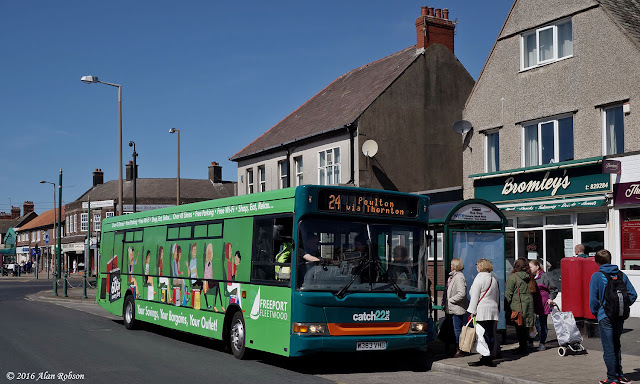 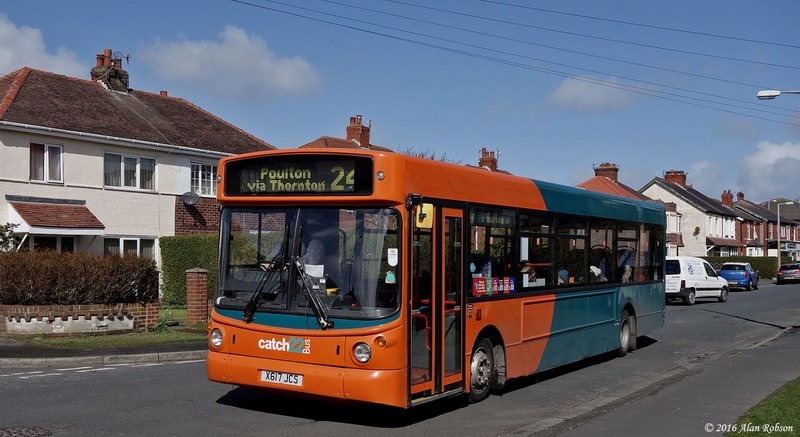 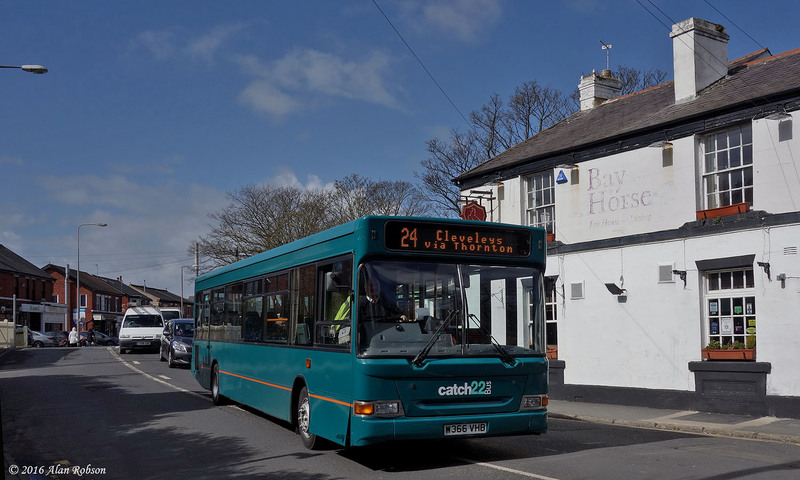 Service 24 runs between Cleveleys Bus Station and Poulton via Thornton Village, operating on a half hourly frequency. Two former Cardiff Bus Dennis Darts have been painted in all-over turquoise livery for use on the new route, these being W366 & W369 VHB. 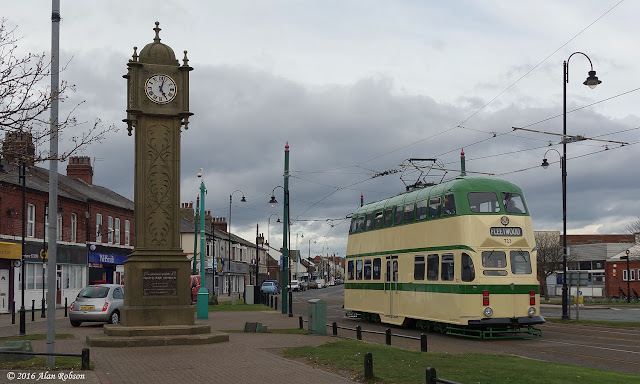 Unfortunately a prior engagement had prevented me from attending the Lancastrian Transport Trust's Ribble Running Day on the Fylde Coast on Sunday 3rd April, however I did eventually manage to squeeze in the final round trip from Cleveleys to Fleetwood and return later in the afternoon. 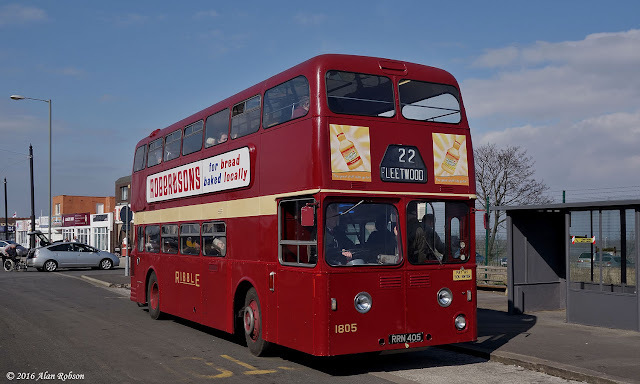 The bus used on the last Fleetwood run was Leyland Atlantean 1805 (RRN 405) with lowbridge Metro Cammell bodywork, new to Ribble Motors in 1962. The other two buses in use during the running day were former Ribble Bristol VRT 1997 (OCK 997K) and Bristol RESL 366 (OCK 366K).